This is as much a Black Panther solo book as it is an extra Fantastic Four monthly. 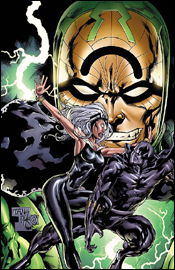 T’Challa and Storm, already regulars in the Panther’s regular ongoing, are once again joined this month by their F4 teammates, Johnny Storm and Ben Grimm. When the team was faced with a threat they didn’t understand and couldn’t overcome, team leader T’Challa unleashed an unfamiliar power in a desperate bid to contain the beast. Good news: it worked. The monster is no longer on Earth, and roams a variety of bizarre landscapes, alternate realities and parallel planes of existence. Bad news: the Fantastic Four are along for the ride, with no clue how to return to the Baxter Building. After a dull fray alongside the cast and crew of Marvel Zombies for the last few months, author Reginald Hudlin has shifted the team into a different locale with this issue. The team has been traveling between realities via a super-powered, gold-skinned toad, and after abstaining from its use during their stay in the Zombies universe, their hand was finally forced at the end of issue #30. With their backs up against the wall, they chose to employ the frog’s powers once again and take their chances with another reality. Aside from a few additional examples of the frog’s eccentric powers, this issue has no real purpose – it’s one needless twist after another, with the story failing to make any progress from first page to last, just a series of soft transitions from one oddball fantasy to the next. More than half the issue is thrown away on a crazed, page-turning imaginary sequence involving Storm and her teammates with the X-Men. The lead characters float mindlessly through the story, occasionally forced to remind one another of where they are and what they should be doing. When T’Challa and Ororo suddenly embrace in one panel, the Thing quickly reminds them that Johnny is unconscious, and the story casually shifts its focus to that plot development for a few minutes before something else steals its attention. It’s like a creative writing assignment from a kid with ADD: imaginative, but so utterly random and lacking in circumstance that it downright refuses to connect with its readers. Where Grant Morrison took a similarly twisted concept in JLA: Earth 2 a few years back, he was successful in grounding it with a compelling story set in reality. Hudlin does nothing of the sort, and seems to be using this heretofore unheard-of superpowered frog to turn Black Panther into his own personal playbox within the Marvel Universe. Artist Francis Portela produces a few bright moments, but is also largely unfocused and visually disinteresting. The Panther himself frequently appears to be staring vacantly off the corner of the panel under Portela’s watch, and the artist’s take on the Thing seems all wrong – like he’s merely wrapped a rocky texture around a vaguely humanoid blob. Storm never looks comfortable, always posing in an awkward position, but in the artist’s defense, she really is a difficult character to illustrate. Few have successfully captured the kind of grace and personality that’s been developed in her character without also giving her a glazed-over, snobby appearance. Within the few panels that he’s given a distinct backdrop to fill in, Portela does fine work, (I especially loved the cityscapes that filled the book’s final pages) but the majority of his contributions here are in the foreground… and universally sub-par. This wasn’t a tough book to read, and it certainly wasn’t without creativity. Most of the dialog is kept noticeably brief, and the imaginary voyages these characters take in just 22 short pages cover a broad range of scenery. In the end, though, it was all flash with no substance. At the beginning of the issue, the cast was walking disoriented into a new reality with no clue how to return home. At the end of the issue, they’re in exactly the same situation. Nothing was accomplished, aside from a few crazy imaginary voyages and another fresh setting. I’m suggesting you skip this and look for something a bit more grounded in reality.